Conner winning best of opposite under judge Virginia Lyne. Titles: Canadian championship, Companion Dog obedience designation, Temperament Test certification. About Conner . . .
Conner was our first Boxer. He was named after the main character in the movie called The Highlander  Conner MacLeod (an immortal). 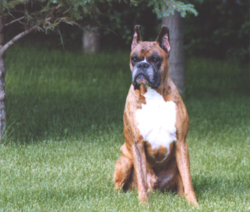 Purchased as a pet from a local breeder, Conner was a fantastic introduction to the breed. He went everywhere with us and did everything that we asked of him, especially at dog shows. Conner is Patti’s hero as she considers him to be Dave’s lifesaver. Read more as to why in this article (PDF) written by Patti. Conner’s show career . . .
Conner and Dave learned about handling and dog shows the hard way, meaning that they did it together, learning what they needed to along the way. Both were very much novices. They learned all about such strange terms as stacking and baiting, gaiting and patterns, presentation and showmanship. It was a fun time, and one to be treasured. In September 1988, Conner obtained his Canadian Championship. 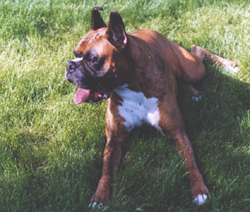 In August 1989, Conner earned his Companion Dog title, with an average score of 190.5. 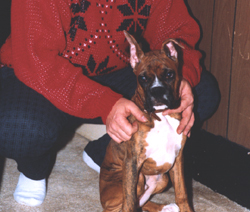 In September 1992, Conner earned his Temperament Test certification. Conner at various stages in his life . . .
Conner as a mature adult. Conner relaxing in the grass.